goARTkids: "Death Becomes Her: A Century of Mourning Attire"
Got a fashionista teen or a goth kid hanging around the house glaring at you on the weekends? 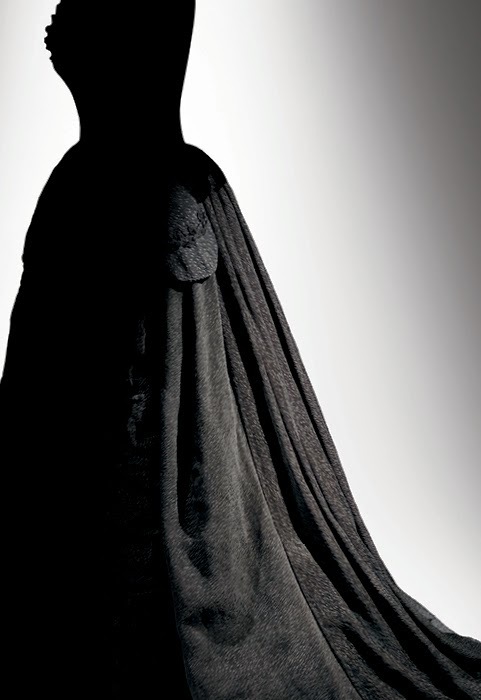 Head over to The Metropolitan Museum of Art's Costume Institute and enjoy viewing "Death Becomes Her: A Century of Mourning Attire," together. Yes, I know how hard it is to get on the same page with your teens when it come to doing something, together. I have one at home. This exhibit got a thumbs up from my teen and hopefully it will interest yours. Those into fashion or history or both will really enjoy it. What you'll see are 30 vintage mourning dresses from the 18th and 19th century. There is mourning dress worn by Queen Victoria. We were stunned at how small in stature she was. For those interested in accessories and jewelry, they are also featured. Bereaved Victorians, sometimes had lockets made with the braided human hair of their loved ones encased in them. You'll see a couple of beautiful examples. We peered at those for a while. I would have liked to have seen more hats and accessory mourning items like shoes and purses. The exhibit is not very large and it is probably perfect for dragging along the smaller kids and dad's (not of the fashion conscious inclination). Hurry, the exhibit closes February 1st. Many pardons for the tardiness of this post. I took more time than I should have in deciding wether or not to include an exhibit from one of the major museums. It's a new year, and I will begin to do so, since I always get asked if I know about this or that big show. Originally, I wanted to highlight only the art exhibitions in art galleries but its too hard not to mention the many great shows in the museums of New York City and the boroughs. So, here's to a new year and a new mission. Happy viewing.